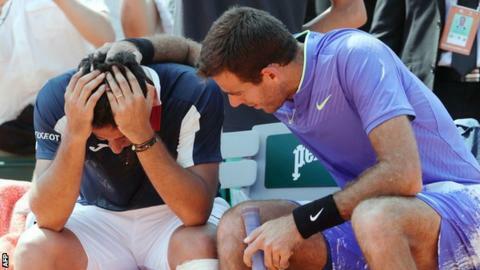 Juan Martin del Potro consoled opponent Nicolas Almagro after the Spaniard quit their French Open match in tears with a knee injury with the scores level. The Argentine helped a sobbing Almagro from the court and will now face Andy Murray in the third round. Del Potro is playing at Roland Garros for the first time since 2012 having suffered a series of injuries. "I told him that tennis is important, but health matters more than tennis in this case," Del Potro, 28, said. "He was in agony. It was tough." Former US Open champion Del Potro, who is now ranked 30th in the world, took the first set 6-3 only for Almagro to level with the same score. The third set was tied at 1-1 when the Spaniard was forced to concede. Del Potro injured a groin in the opening set, which affected his movement, but he said it was "not a source of concern" for his match against Murray. "Today I think I got lucky, because I don't feel good enough with my body," he added. "It's not new. Last year I had some problems with my groin. This is something that I have experienced already." Elsewhere, third seed and former champion Stan Wawrinka progressed to round three with victory over Ukraine's Alexandr Dolgopolov. The Swiss, 32, won 6-4 7-6 (7-5) 7-5 against the world number 89. But 13th seed Tomas Berdych has been knocked out, losing 7-5 6-4 6-4 to world number 53 Karen Khachanov. Controversial Australian 18th seed Nick Kyrgios, who has never gone past the third round at Roland Garros, is also out after he was beaten 5-7 6-4 6-1 6-2 by South African Kevin Anderson. Kyrgios, 22, destroyed two rackets - including one that he smashed six times on a cooler - and was given a penalty point at the end of the second set. World number 56 Anderson goes on to play Britain's Kyle Edmund, who has reached the last 32 in Paris for the first time. Seventh seed Marin Cilic, the 2014 US Open champion, reached the third round with a 6-3 6-2 6-2 win over Russia's Konstantin Kravchuk. Japan's Kei Nishikori, the eighth seed, progressed by beating Jeremy Chardy 6-3 6-0 7-6 (7-5). France's 15th seed Gael Monfils beat Thiago Monteiro 6-1 6-4 6-1 in just 91 minutes, while it took Spain's Feliciano Lopez almost four hours to beat compatriot David Ferrer in five sets. Czech second seed Karolina Pliskova is into the third round of the women's singles for the first time after a 6-2 4-6 6-3 win over Ekaterina Alexandrova. Third seed Simona Halep eased through with a routine win against Germany's Tatjana Maria. The 25-year-old Romanian, a beaten finalist at Roland Garros in 2014, progressed in an hour and 22 minutes. Elsewhere, fifth seed Elina Svitolina came from behind to beat Tsvetana Pironkova 3-6 6-3 6-2. Ninth seed Agnieszka Radwanska also dropped the first set but recovered to win 6-7 (3-7) 6-2 6-3 against Alison Van Uytvanck.